Kieran Sadlier hit a hat-trick for John Caulfield’s side. Cork's Kieran Sadlier celebrates scoring a goal with team-mates. 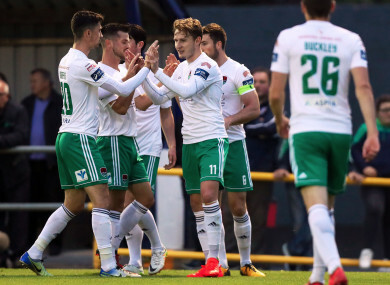 CORK CITY WILL not have many easier games than this one with a close to perfect performance ensuring the Rebel Army will compete in the semi-finals of the FAI Cup. One could not have seen this one coming, as Longford Town came into this game in a rich vein of form, with their opponents suffering a surprise defeat at home to Sligo Rovers last time out. Kieran Sadlier put on a masterclass for the sizeable crowd in attendance in City Calling Stadium, with the attacker scoring a hat-trick and creating two further goals. Darren Meenan’s red card in the 39th minute all but ended the match as a contest, as Longford were never going to be able to compete with the Rebel Army after losing an influential player so early. Meenan was punished a reckless challenge on Kieran Sadlier, with the red card debatable, although in real time it looked like a sending-off offence. Longford competed well for the opening 18 minutes, before Cork opened the scoring courtesy of midfielder Gearoid Morrissey, who managed an overhead kick after Kieran Sadlier’s corner. Sadlier then found the net with a header, after being set up by Karl Sheppard, as the hosts faced a massive uphill battle thereafter. All the top teams display some ruthless characteristics and Cork certainly showed they can be included in this bracket with five second-half goals giving the visitors a 7-0 victory. A mistake from Tristan Noack-Hoffman allowed Ronan Coughlan to tap in Cork’s third goal and it was always going to be a facile victory from that stage onwards as Longford completely collapsed. Kieran Sadlier tapped in for 4-0, before former Town player Josh O’Hanlon found the net. Sadlier then added a wonder goal, before City substitute Barry McNamee scored a late seventh. For Cork, the performance was virtually flawless. For Longford, the opposite was true, with Neale Fenn’s charges not performing anywhere near their potential. Longford Town: Michael Kelly; Shane Elworthy, Tristan Noack-Hofmann, Michael McDonnell, Karl Chambers; Peter Hopkins (Tumelo Tlou 60), Dean Zambra, Aodh Dervin, Dylan McGlade (Eoin O’Neill 63); Darren Meenan; Jamie Doyle (Dean Dillon 74). Cork City: Peter Cherrie; Steven Beattie, Alan Bennett (Barry McNamee, 57), Aaron Barry, Shane Griffin; Gearoid Morrissey (Josh O’Hanlon 67), Jimmy Keohane; Karl Sheppard (Shane Daly-Butz 67), Garry Buckley, Kieran Sadlier; Ronan Coughlan. Email “Cup holders Cork safely through after hitting Longford for 7”. Feedback on “Cup holders Cork safely through after hitting Longford for 7”.